Summary: “I am sixteen years old. I am a human being.” Actually Sarah is several human beings. At once. And only one of them is sixteen. Her parents insist she’s a gifted artist with a bright future, but now she can’t draw a thing, not even her own hand. Meanwhile, there’s a ten-year-old Sarah with a filthy mouth, a bad sunburn, and a clear memory of the family vacation in Mexico that ruined everything. She’s a ray of sunshine compared to twenty-three-year-old Sarah, who has snazzy highlights and a bad attitude. And then there’s forty-year-old Sarah (makes good queso dip, doesn’t wear a bra, really wants sixteen-year-old Sarah to tell the truth about her art teacher). They’re all wandering Philadelphia—along with a homeless artist allegedly named Earl—and they’re all worried about Sarah’s future. But Sarah’s future isn’t the problem. The present is where she might be having an existential crisis. Or maybe all those other Sarahs are trying to wake her up before she’s lost forever in the tornado of violence and denial that is her parents’ marriage. Still Life With Tornado tells the story of Sarah, a sixteen-year old girl who finds herself obsessed with the idea that nothing is original. In the middle of feeling stuck in her own struggles, she's also unaware of her parents' failing marriage and the struggles with her mysteriously gone older brother Bruce that they aren't allowed to talk about anymore. Confused and alone, Sarah suddenly finds herself visited by a ten-year old version of herself, and later on by twenty-three and forty-year old versions as well. She's completely convinced she's hallucinating...until other people can see them too. And these past and future Sarahs help her come to terms with things she hadn't ever stopped to consider before, and the truth opens up an entire whirlwind of struggle, secrets, pain, and disaster. I really enjoyed reading this book. I wasn't sure what to expect when I first started reading it, because the book seemed to pretty much be realistic fiction, and then all of a sudden there was a ten-year old version of Sarah sitting around. Not only that, but other characters in the story were openly acknowledging her, so you know that Sarah wasn't just making her up. And the more Sarahs that appeared, the more confused I was getting. And Sarah is also incredibly apathetic and numb in the beginning of the story, seeming to go through the day-to-day motions, skipping school, making up scenarios in her mind at her "new school," and just generally seeming lost and unhappy. The first few chapters of the book were definitely difficult for me as I struggled to grip what Sarah's purpose in the story was and where the narrative was going to take me. However, as the book went on, I found myself delightfully surprised. As the story moves forward, Sarah remembers more and more of her fateful past and you even get some chapters from her mother's perspective, and you learn a lot about her family history that starts to unravel and make a huge mess. The reader even gets a lot of this information before Sarah does, so there are those highly tense moments where I knew something that Sarah didn't and I was just urging her to hurry up and put two and two together before things exploded. My favorite part of this book was definitely Sarah's love affair with art. I've been on both sides of the fence with her struggle, torn between loving a craft so much that it's all you ever want to do and sometimes feeling so lost and helpless and uninspired that you think you're better off dropping it forever. As a writer, I feel like this is a struggle I am constantly battling with and to see it put out on the page in a totally different way -- but with the scenario still the same -- was both refreshing and reassuring to see. 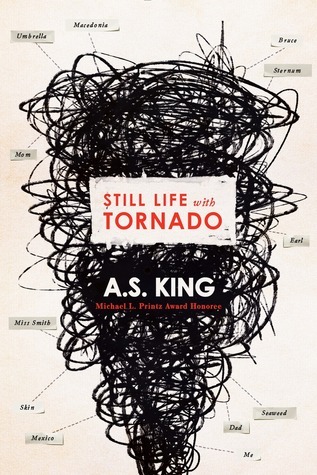 Overall, I really enjoyed Still Life With Tornado. I'm really glad that I was assigned to read this book in my class because I may not have known about it otherwise, and I would've been missing out on an incredibly touching, heart-wrenching, confusing-yet-clear story. I enjoyed how King pushed the boundaries with this one and did a few nonconventional things that I wouldn't expect as a reader or a writer, and these things actually ended up working for the novel and kept things refreshing and interesting. After reading this book and Ask The Passengers, I'd definitely be open to reading more of A.S. King's work in the future -- so it's time for me to go on Goodreads and update my TBR!